FINCA helps Haitians living in poverty access financial services to improve the quality of life for themselves and their families. In 2010, the worst earthquake in 200 years hit Haiti. A country that was already in despair was devastated by the natural disaster. Today, Haiti remains the poorest country in the Western Hemisphere – nearly 60 percent of the population lives below the poverty line. Daily life for a Haitian is extremely challenging. Haiti’s rates of infant and maternal mortality are the highest in the Western hemisphere, despite the fact that many of these deaths are preventable. Education levels are low in the country, with about two-thirds of the population being literate. Haiti also has a high unemployment rate. 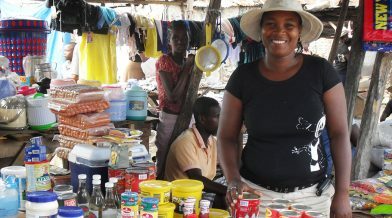 When poor people have access to financial services, they can earn more, build their assets, create jobs, and cushion themselves against external shocks. Since 1989, FINCA International has been helping thousands of Haitians improve their lives. FINCA offers financial services, such as loans and mobile banking throughout the country.